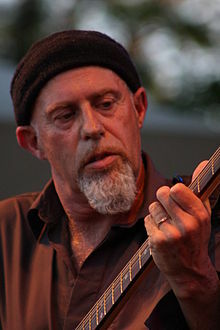 Harry Manx is a musician who blends blues, folk music, and Hindustani classical music. He was born in the Isle of Man where he spent his childhood and now lives on Saltspring Island, British Columbia, Canada. Manx plays the slide guitar, harmonica, six-string banjo, mohan veena and Ellis stomp box. He studied for five years in India with Vishwa Mohan Bhatt. He has released eight albums. Manx was a nominee in the 8th Annual Independent Music Awards for his Cover of "I'm on Fire".